Home / Process / Can sewage and algae solve our energy crisis? en Calderone, Contributing Editor of Altenergymag.com, reports that with the growing trends of energy consumption, existing production is unsustainable. If the world maintains existing policies in energy usage and production, global energy demand will rise by 1.5 % per year on average through 2030, while fossil fuels will remain the main energy source, accounting for more than 75% of the overall increase in energy consumption. How to sustain the supply of reliable and affordable energy for future generations is a challenge that needs to be addressed now. We need to employ a sustainable development of alternative energy. One course of action is the waste-to-energy approach. It has been widely demonstrated that organic wastes – waste biomass, sewage sludge, animal manure – hold a significant potential for energy generation. Wastewater treatment plants use anaerobic digestion to generate heat and electricity on site. Anaerobic digestion is a natural process in which micro-organisms break down the organic matter found in wet biomass waste, such as sewage sludge, animal manure, slurry and waste food in the absence of oxygen, to produce biogas (60% methane and 40% carbon dioxide) and a nitrogen rich fertilizer. The methane gas produced from this process is then used to generate heat and electricity. There are other ways to generate energy from wastewater, such as using energy-rich waste from sources like food processing and restaurant grease to generate heat and electricity. A system designed by CDMSmith turns restaurant wastewater into a clean, renewable source of energy at a water resource recovery facility. Other research is being conducted on using wastewater, which is full of nutrients, to grow algae. These algae could then be turned into biofuel that could replace gas or gasoline. Using algae for wastewater treatment offers some interesting advantages over conventional wastewater treatment. The advantages of algae-based treatment include cost effective treatment, low energy requirement, reduction in sludge formation and the production of algal biomass. Algae play a major role in aerobic treatment of waste in the secondary treatment process. Algae can accumulate heavy metals and remove toxic compounds from the wastewater. In some cases, algae also play a role in the removal of pathogens in the tertiary treatment stage. 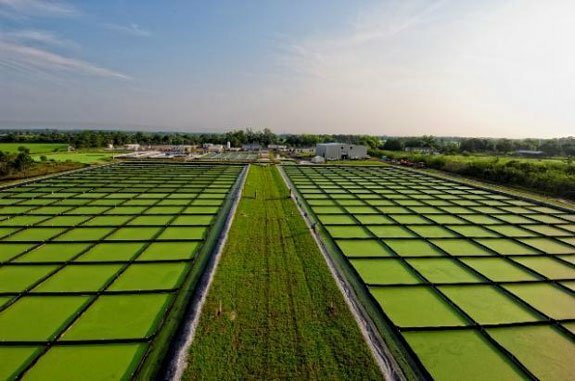 Commercial technologies and processes for algae-based wastewater treatment systems are already available in the market, such as the Advanced Integrated Wastewater Pond Systems (AIWPS). AIWPS do not require sludge management. It takes decades for the removal and disposal of sludge residues. Carbon is transformed in AIWPS through two important mechanisms—methane fermentation and biological assimilation by microalgae. The conversion of waste organic solids to methane, nitrogen gas and carbon dioxide via methane fermentation and the assimilation of organic and inorganic carbon to algal biomass via photosynthesis provide the basis for primary, secondary, and tertiary treatment. AIWPS require much less capital, energy, operation and maintenance than mechanical systems and require less land, produce less odor, and fill in or age much more slowly than ordinary ponds. Sewage is a resource rather than waste. Sewage-to-energy would cut costs, and reduce greenhouse gas emissions. Industry calculations show that if all bio-solids in the United States were converted into biomass energy, they would yield 7 million to 7.6 million megawatts of energy, while the existing capacity of wind power in the United States is approximately 43,000 megawatts.